Always make a dough of proper size. If you make a dough that is bigger then the piece of it will be stuck inside. So it will be easier to clean it if you use the medium sized dough. You can use a brush to clean the pasta machine. Brushes are affordable and will help you to put out the dried up dough from the internal parts of the pasta maker. To clean the main frame, you can use a smooth sponge. The old pasta can be stuck on the roller so take a look at the roller and clean it using a skewer. To clean the rollers properly, you have to rotate the handle and use a pastry brush. The above tips are useful to clean pasta machine after use but to clean it more effectively you have to take off the parts of it. Make sure and remember the positions of every part before removing it. You have to do it very carefully because the parts can be loose. You can use a screwdriver to remove the screws and guards to apart the parts and clean them. Remove the side plate and clean it by using a soft towel. Use a towel to clean the inside of the machine after tearing apart the parts. Remove the top guard using a screwdriver. After removing the top guards, remove the bottom scraper plates and clean them completely. Finally, clean every part that you removed from the pasta machine and then reassemble it again. 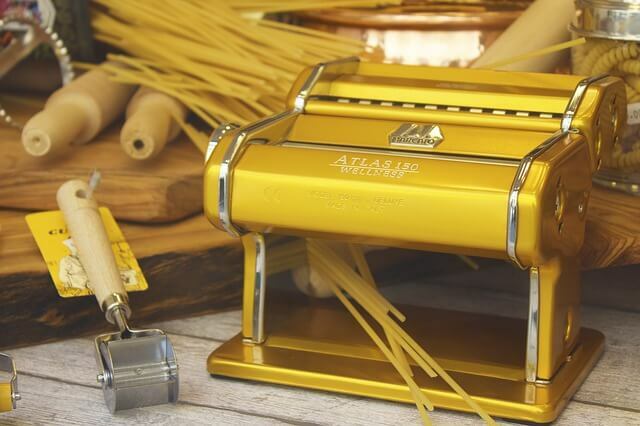 Now you can use the machine to make pasta without thinking about the hardness of cleaning the pasta maker after use. You have to be careful when you are cleaning the pasta machine. Be sure that water is not spilling onto the roller. Water is harmful to pasta maker and it will be rusty if you use water to clean it. Always dry it immediately and keep in dry and flabby place.